The hunters of the deep. 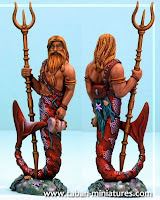 These Nauticans are skilled and fearless in protecting their under water enclaves from ocean dwelling daemons and the terrifying creatures of the deep. The Deep Divers speargun can be fitted with mulit-barbed hook bolts. These bolts are attached to lines and were designed to be fired into shoals of giant squid and are small and cause no wounds (although they can be extremely painful !) The barbed hooks make the bolts extremely difficult to dislodge. If the Deep Divers did not move that turn then they can choose to fire multi-barbed bolts. Important: The bolts are only powerful enough to hook enemies with a str of 3 or less. Any units which contain any models with an unmodified profile str of 4+ cannot be hooked. An enemy unit taking speargun hits of more than half of it's unit's strength is hooked (eg. 6 hits on a enemy unit strength of 10). Hooked units can only free themselves by passing a strength test at the very beginning of their movement phase. Units freeing themselves from the hooks can subsequently move as normal during the rest of the movement phase. Hooked units continue to make a standard (but not march) move during their movement phase directly towards the Deep Diver unit as the Divers reel in the enemy unit and the enemy unit tries to free itself. Under no conditions can the hooked unit make a voluntary move (including charges) unless it breaks free. Hooked units move during the compulsory move portion of the movement phase. If a hooked unit is charged or otherwise engaged in combat it is assumed to have immediately freed itself from the hooks (in a desperate attempt to ready itself for the ensuing combat). A unit freeing itself in response to a charge cannot make a stand and shoot or flee reaction to the charge. The hooked unit movement is subject to all the normal movement restrictions/penalties. If dragged across impassable terrain the hooked unit is destroyed as though it were fleeing into impassable terrain. If the Deep Divers move at all or fire at another enemy or are engaged in combat or declare they have released their reels at the start of their turn then the enemy unit immediately move normally again and count as "unhooked".